I am starting this week with a different type of post, not fashion, neither beauty related. This is going to be the first post from a 6-post series that I will be posting throughout this week. I've been meaning to do this series for quite a while, and finally set some time aside to go through all of my pins on pinterest and the furniture/home websites that I've been checking out lately (mainly Ikea and H&M Home). 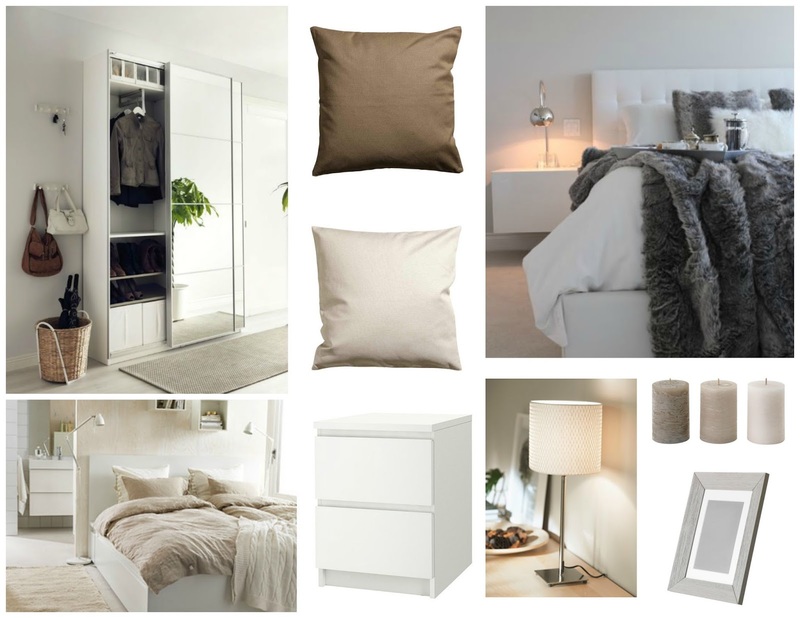 So I've saved my favourite items and decor inspiration from these websites and made little collages of how I plan on decorating each room in our new home. We are in the process of getting an apartment, there's still paperwork to do, but hopefully it will be ours soon and we can start working on it. I'm not sure if I've mentioned this before, but the apartment we're getting is completely empty inside (meaning that it doesn't have floors installed, no tiles etc. ), but that's the way we decided to go, because I think it's easier to make it your own and decorate it the way you like when it's empty. I am so excited about this and that's why I decided to put together these posts, so that I can look back on them and see what my plan for decorating is. The decorating style that I love and plan on going for in the entire apartment is the scandinavian, nordic, minimalist type. 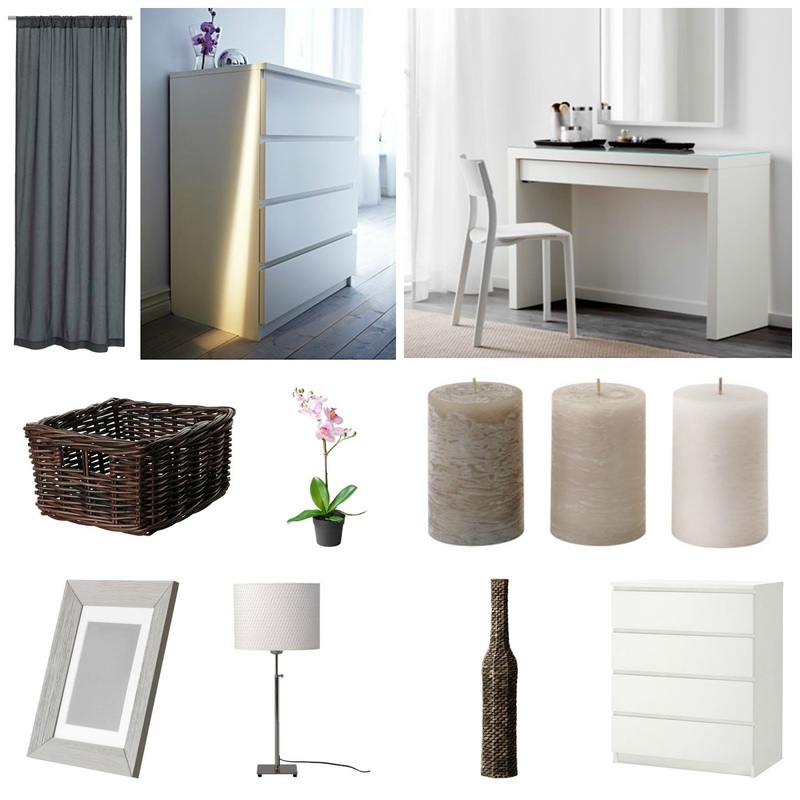 I really like furniture with clean lines, not too embellished or fancy, which you will be able to tell from the inspiration boards that I've put together below. For the colours I want to go for white and grey, and then to warm up the place - brown/cream tones and lots of texture (blankets, throw pillows, baskets etc.). For the bedroom I looked at a lot of white furniture, including the bed frame and perhaps the nightstands and dresser. I think the beige-brown tones will warm up the place and with some fluffy blankets it will make the place look very comfortable and cosy. One thing that I would really love to do is have a closet/wardrobe with mirrored doors. The reason for that is that I feel it will make the room seem bigger & brighter (as opposed to having a plain wooden wardrobe door). I would also love to have a vanity/makeup table in the bedroom. I love the one below from Ikea and I think that's the one I'll end up getting. I love that it's simple and it also has a drawer, perfect for holding my makeup products. That is about it for what I've thought so far for decorating the bedroom. I am sure not everything's going to be exactly as I'm planning right now, but this is mainly for inspirational purposes. I hope you liked to read/see what I would like to have for home decor and I would love it if you would give me feedback in the comments below. Let me know what you think I should add/remove from this decorating plan. If you enjoyed this blogpost, you might also enjoy going through my Pinterest page. I absolutely love this neutral and classic color scheme!